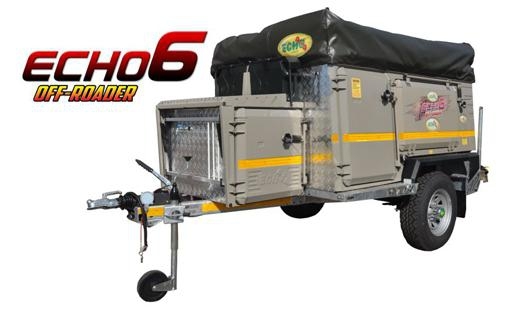 The Echo 6 off-road trailer has been developed over a three year period. All the latest systems were used to optimize all the available space and reduce weight and maintenance .Towing features have been adapted for maximum performance behind the towing vehicle.The galvanized ladder type chassis is rugged and light weight. Overall, an amazing 40% saving on body weight has been achieved. All inner components are designed in modular fashion to speed up fitment time and help our customers to further kit the unit. The Echo 6 is versatile and adaptable not only to travel and camping but also to industrial use and the needs of the military and police. It complies with road traffic requirements in countries all over the world.Featuring a choice of two kitchen layouts and many versatile extras including bicycle rack and rear bin slider with loose standing table. The nosecone is big enough to store a fridge/freezer and also features a wood rack on top. The Echo 6 can be manufactured with either leaf spring suspension with floating rear shackles or as fully independent coil suspension. The unique Parallel lift up rear door opens upwards so that the spare wheel is completely out the way. The Echo 6 is versatile and adaptable for travel, camping, military and police.